It’s the 1960s when TV dance shows were all the rage and segregation was rife. But change is in the air when Tracy Turnblad, a dance-loving Baltimore teen, successfully auditions for a place on The Corny Collins Show. Dreams come true and she becomes an instant celebrity and paves the way for a new style of fashion, dance and fun. Using her new-found fame, young Tracy sets about toppling the Corny’s reigning teen dance queen while opening the gates to racial integration and acceptance on the show – and in her hometown. Written and directed by John Waters, the 1988 version of this American musical comedy starred Ricki Lake, Divine, Debbie Harry, Sony Bono and Jerry Stiller. Re-released in 2007, Hairspray featured John Travolta, Christopher Walken, Michelle Pfeiffer, Queen Latifah, Amanda Bynes and Zac Efron. Brisbane’s Harvest Rain Theatre Company have stepped things up several notches by recreating this classic feel-good musical featuring over 500 local performers and an all-star cast – the biggest production in Hairspray history ever seen in the world. 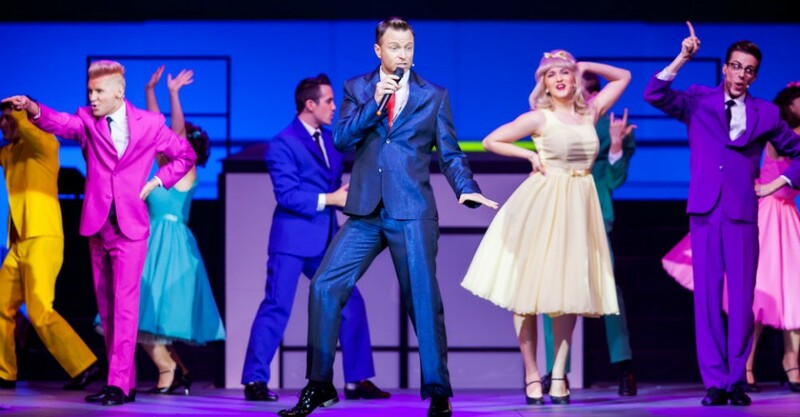 Starring Tim Campbell, Christine Anu, Simon Burke, Wayne Scott Kermond and newcomer Lauren McKenna, Hairspray – The Big Fat Musical Spectacular is set to bring down the walls of the Adelaide Entertainment Centre. We speak with the ever delightful Tim Campbell who, some might suggest – him included, lives and breathes the role of Corny Collins. Hairspray is a big enough show as it is, but to add 600 kids to it must be amazing and overwhelming at the same time. Launched in Brisbane, what is obviously an amazing experience for all involved, but is such a large cast also a distraction? Will audience members know where to look? “To be honest, we’ve had nothing but incredible responses,” Tim says. “Hairspray is such a kitsch really poppy kind of show. But the fact that they have that much to see is really exciting. I’ve seen a couple of musicals where I can’t wait for the interval, let alone the end [laughs], yet there is so much to witness, from great choreography to costumes that include blow-up suits… it’s huge. The creators have put so much in to every aspect of the show. They won’t let you keep it as a souvenir? Corny Collins is such a ridiculous name, but back then things had different meanings. To be gay was to be happy, and corny no longer describes a cool guy that hosts his own TV dance show but is a total dag. So, you were made for this role! Is it one that you have ever dreamed of performing? John Travolta really made the role of Tracy’s mother all his own. Big shoes to fill. How well does Simon Burke fit those heels? Tell us about Christine Anu as Motormouth. There are so many musicals that have such brilliant songs. Hairspray is no exception with songs such as Good Morning Baltimore, I Can Hear The Bells, The Nicest Kids In Town, (You’re) Timeless To Me, Hairspray and I Know Where I’ve Been. Do you have a favourite part of the show? “It would have to Christine singing I Know Where I’ve Been. At that point I’m waiting in the wings to go on so I get to sing along as well,” he says. “One of the other great things about this show is the music, so I haven’t got sick of it yet. I was saying earlier today that I don’t do long runs of musicals because I get bored, but that’s not the case with Hairspray, because I really love the music. ‘Christine’s song is a big big number and there are also some great Vaudevillian moments with Wayne and Simon; they do this little dance/waltz together with a little slapstick thrown in, which is fun. The Madison is good too, because all of the kids are on stage. It’s a huge moment. Because it’s part of the ‘TV show’, I just get to wander around, smile and take it all in. Like I said, I don’t act in this show, I just go and enjoy it and say some words in between [laughs]. Newcomer Lauren McKenna plays Tracy Turnblad. Hairspray – The Big Fat Musical Spectacular performs at Adelaide Entertainment Centre, at various times, on Fri 14 Oct until Sat 15 Oct.